PMAL is an absolutely beautiful out of the ordinary venue! We wanted a true fall Maine wedding and this venue met all our expectations. The owners were phenomenal to work with and we couldn’t be happier with our event. 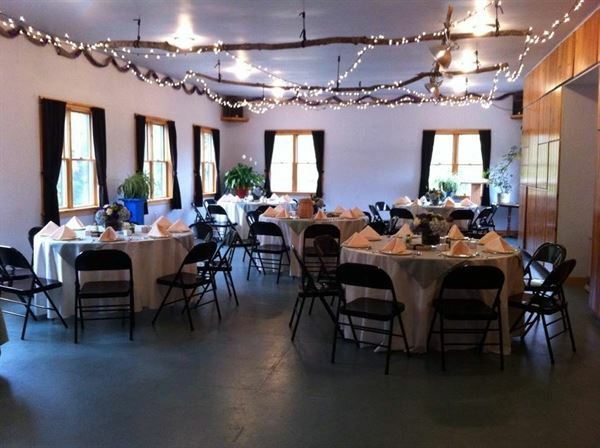 The Peninsula Metamorphic Event Center was just what we were looking for in a wedding venue. We had our wedding reception there in October, which was beautiful with foliage, and the outside setting we had hoped for. We had about 70 guests, and the venue was the perfect size for us. The owners were very flexible with hours and accommodations, along with being helpful with tent setup. We were very happy with our BBQ style fall wedding there, and will forever cherish the memories! Our company has held several shareholder meetings at PMAL and we have always been pleased with the layout, the space and the presentation equipment. Chris and Amy make the logistics easy and provide all the support needed. I would definitely recommend PMAL as a business meeting venue! We used PMAL for a live band performance. The space was perfect and very flexible. A stage/platform was available but we opted not to set it up. There was plenty of room for the 7-person band, a sound person (we provided), seating and dancing. Plus, we had space for refreshments, a ticket selling spot and plenty of parking. The staff at PMAL were so accommodating with all of our needs and were truly lovely to work with. I would highly recommend the space for gigs and all kinds of events! What a great place to hold a party event! Rented the facility twice this past summer - once for a high school graduation party, and once for a 50th birthday party. Plenty of parking, plenty of seating, nice dancing area, ample kitchen space. The owners are a dream to work with. I would definitely recommend PMAL to anyone!